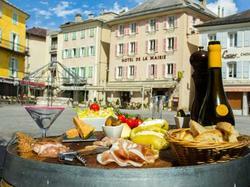 The 2-star Hotel De La Mairie et du Marquis is located in the centre of Embrun. Its rooms are serviced by a lift and have flat-screen satellite/cable TV and private bath or shower. The restaurant is known around Embrun for its traditional and fine cuisine, made with daily fresh products. Its 1870s-style bar is also a local attraction. Guests can visit the local market in front of the hotel on Wednesday and Saturday mornings. Many mountain and water activities can be enjoyed in the surroundings, including paragliding, via-ferrata rock climbing, hiking, cruising on the lake, and river activities such as rafting and kayaking. Serre Poncon lake is 3km away and Les Orres and it's ski resort is 18 km from the property. A secured parking for bicycles and motorbikes is available. Please note that the Hotel du Marquis is located 50 metres from the main building. Please note that there is not Canal + in Hotel Du Marquis and there is no elevator. Instead, the rooms are accessed by a staircase and are on 2 floors. This studio has a seating area, oven and sofa. This apartment has a satellite TV, electric kettle and seating area. Located in an historic building separate from the main house, this renovated room features double or twin beds, a satellite TV, a telephone and a desk. It is complete with an en suite bathroom. Guests have access to all of the facilities in the main building. A flat-screen TV and free Wi-Fi feature in this room. This room features satellite TV, a telephone and a desk. It is complete with an en suite bathroom.